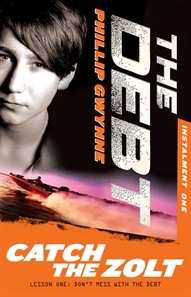 First cab off the rank for 2013 is the first book in a new series called The Debt, book one is called Catch the Zolt, and the series name gives you are fair idea of what the book might be about. Dom has just turned 15, and on his birthday he learns about a family secret that will change his life. Dom Silvagni's Great great great great grandfather Dominic came to Australia in 1822 during the Gold Rush, he was born into the 'NDRANGHETA, which is like the mafia but not as nice. He defaulted on a loan and as a consequence all Silvagnis males, upon reaching the age of 15, must make six repayments on his debt. His father repayed the Debt, his Grandfather did not, and the price for this was a pound of flesh, they took his leg! Happy Birthday Dom, it's your turn to pay The Debt! Dom is not allowed to go to the police, he can't ask his family for help and he can't tell anyone about the Debt, but he has just been given his first directive...catch the Zolt. The Zolt is a modern day Robin Hood, who has been joyriding in the cars and planes of the rich and has basically been making a nuisance of himself, he has escaped police custody, and now it looks like Dom is the one who has to find him. There's lots of action, boat chases, shoot outs, helicopter rides and all of the glamour you would expect from the rich and famous on the Gold Coast. The first three books will be coming out in quick succession, in January February and March (see pics below), with the final 3 due in June, September and October. Dad and Gus kept exchanging looks, clearing their throats, as if neither knew exactly how to start this conversation. So I did it for them, saving them some pretty amazing embarrassment. A look of relief crossed Dad’s smooth face. The feel of this story reminded me a lot of another series that has been incredibly popular over the last few years, the Conspiracy 365 series written by Gabrielle Lord, and I think The Debt will appeal to much the same audience. 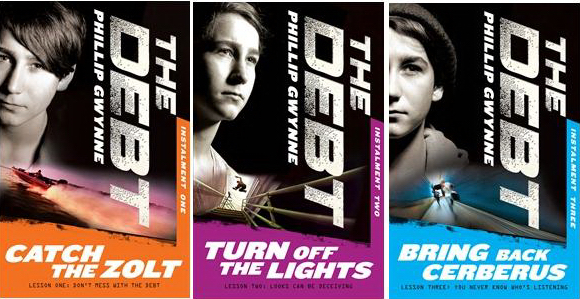 The name Phillip Gwynne is a well known one in Australia, most notably for the book Deadly Unna which won the 1999 CBC Book of the Year Older Reads and was also made into the film Aussie Rules. I have a feeling that this new series may just become the ‘must read’ series this year, especially for boys age 12+. If you like the Debt and Conspiracy 365, there is a new series coming, the firt book is due out in September, that I think you will love too...it's called The Last Thirteen by James Phelan. Keep your eyes out for that one!